I’ve been gardening for many years — both in vegetable beds and using containers on balconies. Whatever the situation has been, one of my annual keys to success is seaweed. It’s true, most other things called ‘weeds’ we’d rather keep out of the yard, but when seaweed is available it’s one of the best kinds of organic fertilizers nature provides. Not only does seaweed supply important nutritional value to soil, it also helps stimulate growth in plants, enhances the dietary value of crops, and aids in reducing certain pests like unwanted nematodes. The first thing to know about seaweed in the garden is that the main type found on beaches is called kelp. It’s the long rubbery-like strands that get caught in shallow water and often cover shorelines when the tide recedes. Collecting it is easy and there’s no danger of thorns or other prickly edges when touching it with your bare hands. Simply pick it up and place it in something made of mesh to help drain excess water. Then place it in a plastic bag and bring it home. The most important part of the collection process is selecting fresh, meaty, and moist pieces. This means they still retain most of their important minerals and nutrients, which are lost the drier and older they get. I should note that since kelp is from the sea, some say the salt content may disrupt the delicate balance of a garden’s soil. However, the small amount of seaweed normally being used in the standard kitchen garden and other spots around the yard shouldn’t make much of a difference. From personal experience, I can say it’s never been a problem. Nevertheless to alleviate any concerns the strands could be hung up on the garage door or over a fence and sprayed down with a hose. There are a few different ways to distribute seaweed to a garden. The easiest method is taking strands of kelp and simply covering the soil around plants, bushes, and other vegetation like a blanket. Whenever I lived close enough to the ocean I did this every year at the beginning of the season and sometimes towards the middle. 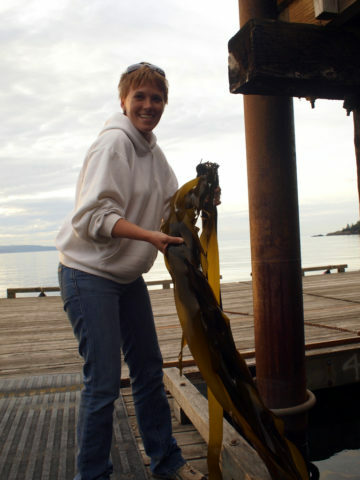 A second technique is to make a seaweed solution by placing a healthy 4-foot strand in a closed container with around 4 to 5 gallons of water. After it ‘marinates’ for a few days, the solution can be poured in a spray bottle and applied to the leaves of plants you intend on feeding. Amazingly, the leaves absorb the nutrients through a process called foliar feeding. Collect it from clean beaches only. When I was growing up, the beaches in our immediate vicinity had various problems and there were years we had to find it elsewhere. Use public beaches for gathering. Getting in trouble for crossing over private property, or entering a beach off limits to the public without permission is a lot to risk for a few pieces of seaweed. Earthworms aren’t exactly happy when they encounter seaweed. As a result, they may leave the immediate plots. However they will be back to help cultivate the soil.